Forty-seven strategies elite managers follow to reach the highest level of success. 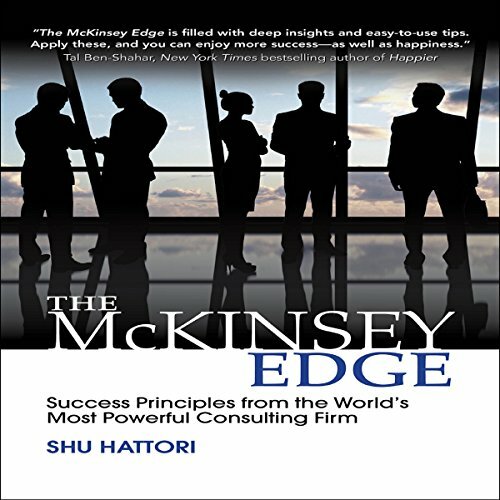 The McKinsey Edge culls the personal best practices of an exclusive group of managers connected to McKinsey & Company, a firm that services 80 percent of the world's largest corporations. Through a wealth of 47 rigorously selected, battle-tested, immediately implementable, and practical tips, listeners discover the secrets to building the self, growing with others, enhancing process management, and going the extra mile to reach the next leadership horizon. All who are struggling to accelerate their careers will keep this book at their fingertips for its rare, real-world advice for ascending through the levels of management - all of which require specific mind-sets and capabilities that only a handful of people ever master. NOT one of those business books that are 10 times the size they should be. Immediately applicable to consultants and anyone in project based roles. No value in leadership development. Good concise overview of what the important elements are with respect to business consulting. The fact that these elements are practiced at McKinsey gives them credibility. I thought this was a good overall overview of consulting in general. Loads of tips on managing yourself, others and your career. Great book, short and to the point. Highly recommend it. I recommend this for all both students and professionals. I certainly do wish I had this proper to B-school. But it is worth reading/listening even at this stage of my career. Gives a little more gas in my tank to travel. Lots of great take aways and reminders for immediate impact. Quick but fulfilling read fit anyone looking to improve their success habits. I just started a transition in my carrier into a leadership position at big tech company and this book gave me the tools to better understand and elevate my own and my team performance to deliver better results. all exemples as reasonable and totally applied into the business world. I really enjoy it. I’ve listened to this three times now and will continue to often to it. I get something new out of this book every time I listen to it. Shu Hattori has really put together something awesome here and John Haag’s delivery is incredible. this book exceeded all my expectations. When I selected the book I was looking for something to help help expand my thinking abouy consulting. this book does that in so many ways. An inside peek at systems and processes and branding of renown consultant firm. Very MadMen esc.